Summer is a time for fun adventures, exploring the outdoors, and having the time of your life. At Big Bear Adventures we make sure that all of your activities get checked off your list. This summer bring your campers to Big Bear to experience team building and adventure all in one place. With great discounts and fun group activities for everyone, your campers are sure to enjoy Indian River Michigan. At Big Bear Adventure your campers’ will have a blast. 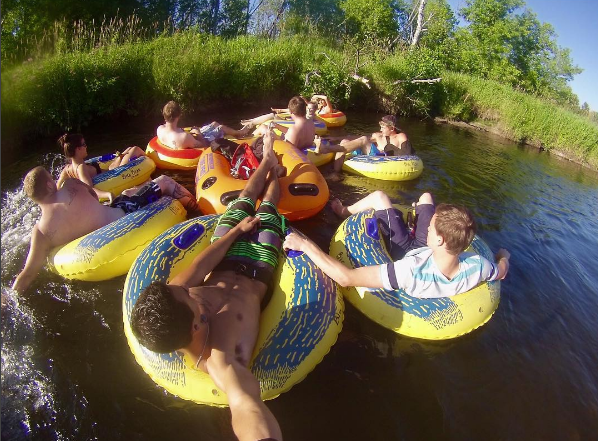 Take part in an exciting Raft or Tube Trip on the crystal-clear Sturgeon River, 18-Hole Adventure Golf, kayaking, and more! Our summer camp packages are very popular among youth groups. With the shorter intervals and a variety of activities, their attention and excitement stay satisfied. Our River Rafting Trips are the biggest hit with any age group. The trips run on the last part of the Sturgeon River, where it slows down to an easier section. The ending location is in beautiful Burt Lake State Park. The Park offers over 2,000 feet of sandy beach, which is perfect for taking a swim or just lounging around. Our raft trips promote teamwork while still having an enjoyable time. Also, chaperones the rafts are nearly impossible to tip over, which will give you the peace of mind and allow you to enjoy the rafting experience as well. At Big Bear, all activities are ideal for any age group and can have a great message of teamwork, sharing, and motivating others in their fears or difficulties. Reservations are required to qualify for a special, discounted group rate and to make sure the desired date, time, and equipment are available. We require a confirmation and final count no less than two days before your outing. Big Bear Adventures is here for your campers to enjoy and see Indian River Michigan. Call (231) 238-8181 to plan your next summer camp at Big Bear Adventures and get out and enjoy the sun!